In a monsoon climate, salt accumulates not only in drylands, but also in paddy fields during the dry season. Because natural desalinization by gravitational drainage is very difficult in paddy fields, drainage facilities are needed to remove salts from affected paddy fields. A rice husk underdrainage system (RHUS) is one applicable method. Although this system is simple and reasonable, there is an unfortunate lack of available information for its practical realization. In this study, we conducted numerical field-scale experiments with an RHUS using HYDRUS 2D/3D software to obtain information for designing such a system. 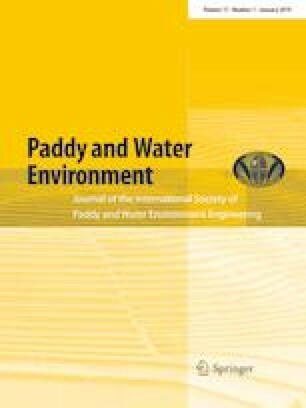 Our results clarified the effect of outlet size, rice husk drain (RHD) width, and RHD gradient on the amount of discharged soil water/salts and saline water movement in the paddy field. We summarized our results as follows: (1) outlet size did not affect the system’s drainage ability; (2) small-width RHD discharged saline soil water at a greater rate than large-width RHD when using the same amount of leaching water; (3) because the RHD worked as a bypass of saline water movement from the plow layer to the lower soil layer, the amount of saline water removed from the plow layer was larger with the large-width RHD than with the small-width RHD; and (4) the large gradient of the RHD was advantageous in increasing the amount of discharged saline soil water, but the effect was small, so it appears unnecessary for practical application. This study was financially supported by the Grants-in-Aid for Scientific Research of JSPS and the Tottori University International Platform for Dryland Research and Education.